Have you ever experienced an inspiring teacher? Been completely enthralled by a lecture? That is what our entire third day was like, being with the amazing Dr. John Walsby. He is truly a Walking Wikipedia — botany, geology, history, architecture, zoology, marine biology–you name it, he can speak at length about it. Although his extensive knowledge was impressive, what was most memorable was his delivery. He talks with his entire body. For example, he didn’t just say “boom” when describing a volcanic eruption — instead, his whole body exploded–with arms and legs flying in all directions. Dr. Walsby is a writer, an artist, a marine biologist, the author of 5 books, weekly contributor to Nature Watch, a newspaper column, and one of the most entertaining and memorable speakers I’ve ever encountered. So, what did we learn? Although we tend to lump Australia and New Zealand together, that island just to the west of New Zealand is about 1,200 miles away. New Zealand’s weather is influenced by its location midway between the equator and Antarctica. It gets warm air from Australia and cold air from Antarctica, which makes for plenty of rainfall. The North Island gets many brief showers, averaging about 4 feet per year. The joke is that Auckland gets all four seasons, frequently within the same day. Despite cloudy skies in many of the photos, the weather has been quite lovely! The earth is like an egg cooked in a microwave: a solid core surrounded by an ocean of magma with a cracked crust. Volcanic activity is like tea being brewed on the top of Mount Everest or a bottle of champagne being uncorked, with the crust on top being the cork. Important fact–volcanoes don’t erupt in the same place twice. Once it goes dormant, it is done. The formation of New Zealand was compared to a scab that formed on your knee (the knee being Australia) that gets “flicked off”. Our first stop, Lake Pupuke, was created from a volcanic eruption. A mile across and a half a mile deep, it supplies fresh water for the nearby town of Devonport. 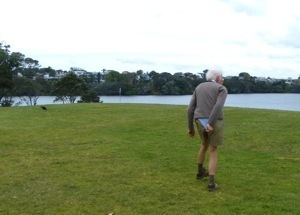 Here is Dr. Walsby, demonstrating what happens when a pukeko gets frightened. The pukeko flushes a white tail to warn his compatriots of impending danger. Had I been faster with my camera, I would have caught him flashing the white handkerchief tucked into the back of his pants. 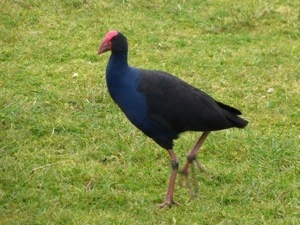 And here is a REAL pukeko. 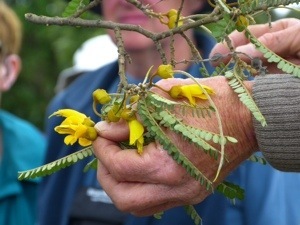 This beautiful flower is fertilized by birds, rather than insects. It’s “lady parts” are on the outside, rather than the inside of the flower to make it easier for the birds to do their important work. Can you see the long appendage? 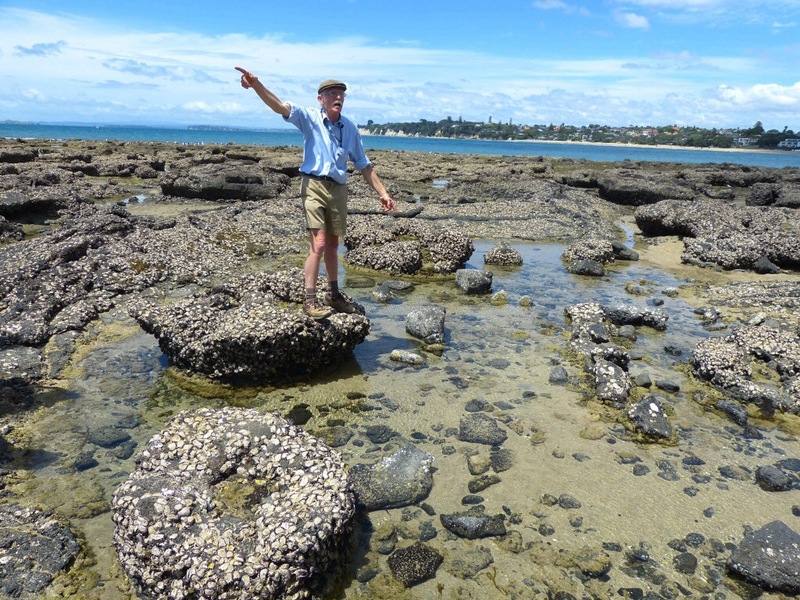 Our next stop is Takapuna beach to see the fossilized trees. 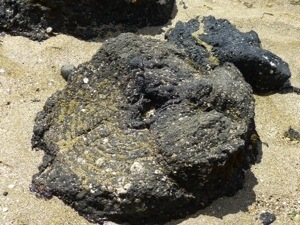 When the lava flowed from the volcano, the trees were snapped at the base, with a portion of the trunk remaining. It became encased in hot lava. The flows are clearly visible around what was once a tree trunk. 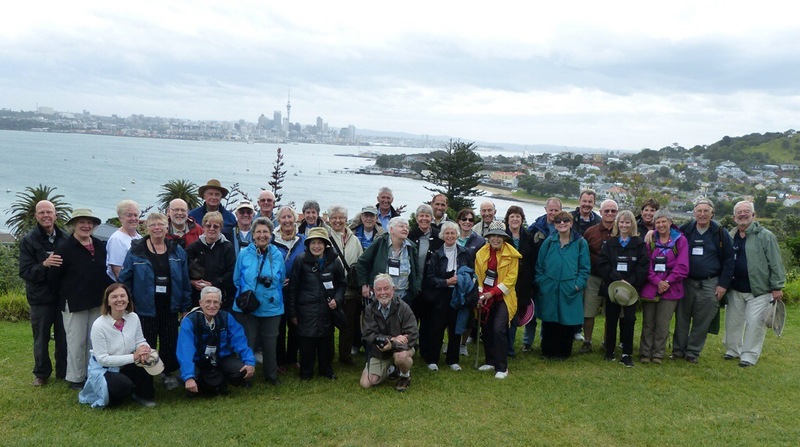 Our final stop was at North Head, a great spot for our group photo. I’m not pressing my luck–I’m going for the upload! Thank you Queensland Airport! LOVE reading your posts, Shelley!!!! Aww, thanks, Sally. I really love getting positive feedback, especially from you.